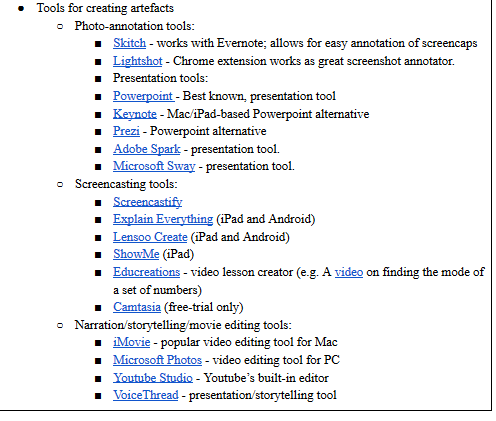 Wow, there are so many content creation tools! I am always looking for fun and creative ways to enhance my lessons in the classroom. I like to try to incorporate new technology and new ways to present knowledge to my students. This way, I can make sure I can reach all learners in some way. Once I am comfortable with a new tool, I like to let my students explore it as well. In saying that, I am aware that it can be very time consuming to do this for the a teacher. That is why I am excited to get this opportunity to explore a new one! Out of all the wonderful options, I choose to check out Powtoon. I have never used Powtoon myself but have heard nothing but great things about it. I decided to download it to give it a shot to see how I would like it. Upon my exploring, I remembered watching a Powtoon video someone made for their summary of learning assignment last semester. I remember thinking it was pretty funny and actually, I quite enjoyed watching it. After some investigation, I learned that the overall idea of Powtoon is to create or make animated videos or presentations. I picked out a couple strengths right off the bat. You can add several features into your videos such as music, voice recorder, and movement! You can also choose from a variety of presentation formats including and explainer video, marketing video, infographic video, ad, or just a blank Powtoon. Just for fun, I started creating my own Powtoon. It was super fun but I definitely need more practice. I guess one weakness would be that it is a bit overwhelming at first. I had to look up some YouTube videos on how to navigate the site. I think that it is going to take me a few tries to figure things out(just like any new tech!!!). I did appreciated how easy the the Powtoon dashboard was to work with. It included all the different templates, background features, characters, shapes, props, media, etc. Similar to word press, it is pretty easy to navigate to those main add ons. Another potential weakness I noticed is that there is a 3 day premium trial. I am wondering what all features will still be available after the trial. Hmm…. to share their knowledge with. As well, if teachers are looking for non-traditional ways to assess, this is a great option. Students who enjoy using technology might really excel using it. I also think if teachers have some extra time, they can create presentations with it. This would definitely enhance lessons and make them more engaging. Have you ever tried Powtoon? Do you use it in your classroom? If not, how do you use it? How do you FEEL about Powtoon? What are your thoughts?